When I first wrote about the potential impact of the iPad mini on Apple’s profits, back in September before it was even announced, I enumerated the different factors that will negatively impact Apple’s profits: whether it serves customer needs; its competitive positioning; and cannibalization of profits from other product lines. More importantly I then wrote that the iPad mini is about profits as opposed to market share. If it’s not going to be another billion dollar product line, Apple simply would not consider it because of the significant opportunity costs. In contrast, most who wrote about the iPad mini, from stock analysts to bloggers, focused instead on market share. They made their case based on the apparent success of Kindle Fire and behemoths like Google entering the low-end market. To paraphrase what many opined, a smaller iPad would allow Apple to continue to grab market share as its competitors nip at its heels on the lower end. Funny—since when did Apple start worrying about market share over profit share? Apple’s official announcement last week did two things. It quickly demolished the market share argument—at a $329 price point, Apple is obviously not targeting the lower end of the market. And it also reinforced the thesis that Apple plays a profit-share game; that is, it’s focused instead on soaking up any possible profits with a carefully designed pricing strategy. In short, the iPad mini is not competing on price, in fact it is not even competing for the same customers as other players in the 7-inch tablet market. Unfortunately, and crucially, we cannot tell from Apple’s messaging which customers they are targeting or how they are positioning the mini. AllThingsD is positioning it as the iPad for those who find the current one too big and heavy. In my last article I wrote that Apple would try to position the mini as yet another device we all must haven in addition to the iPad and iPhone. That is clearly not the case though, as evidenced by their messaging. My best estimate then is that they uncovered a sizable market segment that values lightness and smallness in a tablet, but is not willing to give up the user experience they get from iOS by switching to any of the Android tablets. How big is this segment? Will any of the current iPad customers see more value from lower-priced and smaller-sized iPad mini and switch? Let’s run some numbers to find out. As I did in the case of Pinterest revenue modeling, I am going to use statistical model to find the profit impact. What we will find is how likely each profit scenario is when considered against the input conditions. 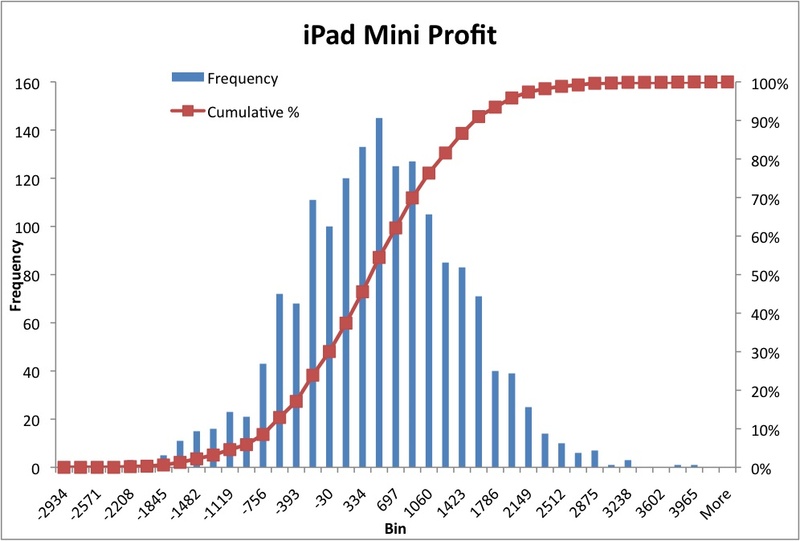 If you are a betting person you will see this as the odds of Apple making A specific profit (or loss) from iPad mini. 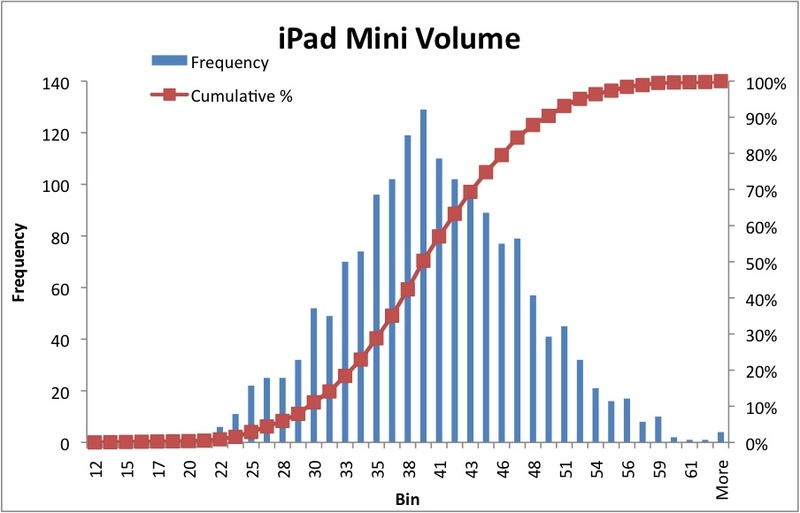 We determine the Volume of the iPad mini from four sources. There are those buying it as their first tablet, or as an addition to their current iPad. Then there are others who are trading down from an iPad, which is to say choosing the mini instead of an iPad. Finally there are those switching from Android tablets and then those who trade-up from an iPod Touch. 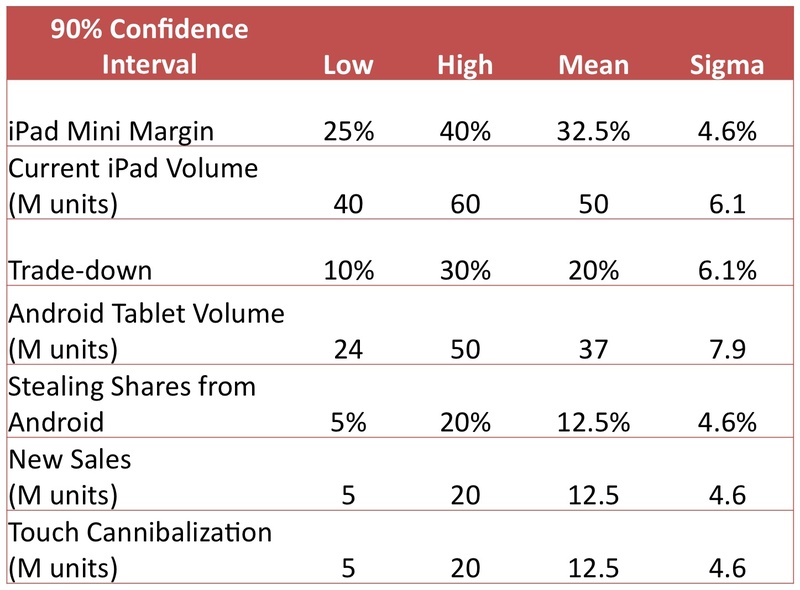 We know for certain the margin on the iPad and iPod numbers (~42 percent). But for other variables we have to make an estimate to do the modeling. We begin with listing the different variables that feed into final result and their 90 percent confidence interval values. That is, we list all the different variables, and then state the low and high values that we are 90 percent confident about (we are 90 percent confident the real value is between low and high and there’s only a 10 percent chance the real value is outside this range). Estimates for Trade-down volume come from marketing research conducted by TechBargains.com, however that was likely based on the assumption that Apple would price their iPad around $199. Given the unexpectedly higher price point, I used a range of 10 to 30 percent, versus their average of 35 percent. With these inputs I ran a Monte Carlo simulation to find the likelihood of different volume and profit scenarios. After running 1600-plus iterations, the results are stunning. The results show that at the low end, come what may, Apple is all but guaranteed to sell 12 million iPad Minis per year. At the high end, Apple could sell as many as 58 million, but those chances are very very slim (1 percent). Considering all the possible scenarios, the expected value of volume is 40 million. These are large numbers that frankly Google and Amazon could only wish for. But an interesting question is whether those big numbers automatically translate to big profits. The results point to a high-risk game Apple is playing with the iPad mini. At the low end they could possibly lose $1.7 billion and at the high end they could make $2.5 billion in profit. But the chances of both these scenarios are just 1 percent. And so realistically, considering all possible scenarios, the expected value of profit is half a billion dollars—and that is gross profit, not including marketing and other costs associated with iPad mini. On a per unit basis that translates to a $12.50 incremental profit. And note that the volume and profits are just expected value—the actual results could be worse because in a surprising 30 percent of the cases, Apple is losing money from iPad mini sales. So despite an expected strong sales volume of 40 million units, Apple will realize at best just a teeny, tiny profit compared to iPad and iPhone lines. Such high volume is certainly nothing to be sneezed at (especially if you’re an Android tablet seller, with shelves full of stock), but the outcome of the game is not certain. Even with the assurance of expected of strong sales, the incremental profit from iPad mini appears too small to make any dent in Apple’s overall profit share. It leaves us to conclude that, strengthened by its string of successes, Apple chose this time to focus only on the bright side and unusually play a high-risk game. Rags Srinivasan specializes in product strategy and strategic marketing and blogs at Iterative Path. Follow his tweets @rags. I predict the iPad mini has already begun to have a substantial “Halo Effect.” This will increase once the election passes and people begin holiday shopping. There is no metric by which we can measure this phenomenom accurately. Perhaps you will come to the same conclusion as I have: people believe in Apple. Why? Cuz they built great stuff. Put that in your laboratory and study it. The commercial use of iPad will certainly increase. This new size is perfect for retail installations. Risky move by Apple? Not at all. As others here have noted, you neglected the halo effect, app sales, and all of the new enterprise level applications that the iPad mini will open up. The statistics make for nice fluff. Too bad you release this before the teardown. The component cost is around $180. Of course you had all the expenses to build it, package it and ship it. But the margins are going to be pretty decent. Wow – how can a professional write an article that is so far off that a 6 year old could have done better? With the tear-down cost of the “base” iPad mini at $188, you better take some basic math courses before you waste your time (and mine) doing another “analysis”. – the market they address is developing nations and EU where the vast majority would never pay 600$+ for an ipad 4 (that’s where the price ends and that’s about the average monthly income in developing nations ,more or less) .Going from ipad 4 with it’s perf,high res and bigger screen to the mini is a big step back and that’s why what gets cannibalized is mostly the cheaper, slower, low res ipad 2. In the US many ipad owner will just buy both,for no good reason. – you don’t account for accessories and lager storage/4G, those models push margins up more than on the bigger prods due to the lower starting price. – the Touch cannibalization is minimal,the form factor is radically different and your numbers are plain nuts.Apple will sell this year maybe some 35 mil ipods and about half of them are Touch.Every year ipod sales are down too so your numbers are way way off.Going back to margins,don’t bet that the Touch has better margins,take into account that it starts at 32GB and account for all models and accessories. – new connector has a minimal impact but spurs the demand for adapters and/or new docks and Apple’s stores get at least a cut there too. To recap, rethink what gets cannibalized,what is the real ASP and how much is the TAM expanding. PS: Any bets on China sales? So if the iPad mini sells 40 million units at $329+ and the cost to manufacture is $188, that’s $141 gross profit per unit. Any company would take that. And that doesn’t raise some tiny suspicion in your head that maybe your model is way off? I’d love to see them lose some money, but it doesn’t take much logic to understand that it is practically an impossible scenario. You can’t just throw around estimates and claim all sorts of confidence levels and expect people to respect it because you hide it behind shiny graphs. So the “new” or incremental demand for the mini is as low as 5 MM per year? If that is true, then why bother to make this? As Joe already noted, the margin numbers are off. Why did you use a monte carlo simulation, when this could have been done with straight statistics? In any event, why are you showing cumulative curves? All normal distributions have such a curve, what purpose does it serve to show this? Do you understand what you are graphing? This is a normal distribution, what justification do you have for that assumption (implicit in others comments are that this is a wrong assumption)? If you are going to use statistical analysis, please do so correctly, this is a nonsensical article. Margins are higher than you estimate due to models with more memory and cellular. Second, 30% of the minis will be a second iPad for customers. Third, the cover is a default buy with the mini which adds margin. Finally, it adds another group of customers to the apple halo effect for future purchases including apps and music. Interesting analysis. I think there are a couple of issues though. For one, the ASP is likely to be much higher than the $329 starting price. Many folks buy a case and/or upgrade storage. I think a $415 ASP is probably more likely. Second, the cannobalization of the Touch is probably overestimated. Apple sold about 3.5 million last quarter and considering the refresh it’ll probably stay around the same, at minimum, or go higher. Third, what the mini is most likely to do is open the tablet market further particularly for education (think K-12 who was already buying iPad 2s in high quantity), the medical sector and restaurants. Families will also be more likely to buy two minis for kids, where a full-size iPad didn’t necessarily make sense. @funknap: Sir you are RIGHT on! I am looking for two minis – “for my boys.” Looking for one low end, and the other higher (for me too)! You don’t seem to be considering increased App Sales in your calculations. There is also the famous halo effect that can result from getting iPad Minis into the hands of people who did not previously have an Apple product but will go on to buy more… and more apps! Yes. The halo effect is more powerful than most folks realize. The App sales aren’t all that relevant. The App ecosystem, and the investment people have made in it, is what keeps people coming back to buy Apple products. It is better to cannibalize your own market than let someone else do it. Rags says that “Apple makes a teeny, tiny profit” on each one? But how does this compare to both Amazon and Google’s profit on their competing devices? (Pretty aggressively I would suggest). All in all the article is hot air. Current ASP of ipad is $535 including accessories. price has only reduced $70. that is $15 billion in revenue. with 25% you get $3.75 Billion. All the statistic mumbo jumbo is college level BS. Next Quarter margins will recover with even more volume. You seem to think most of the sales will be low end. Plenty of people like me will…and I just did buy the cell version and forward $850 to Apple gladly.